Buried deep in the market area of Dublin, almost underground, is a historic Irish abbey. Here, in this hallowed space, six women dressed in yellow come, one by one and night after night, to wash and re-wash the long garment they are wearing. The act of repeatedly submerging and scrubbing the cloth becomes an act of cleansing and rebirth, their raw knuckles scraping, increasingly violently, against the fabric. The grunts and groans of their efforts become haunting cries echoing throughout the chamber. Their bodies twist and contort, becoming harbingers of an almost talismanic energy; an energy that can be felt like breath on your face, an energy that collectively becomes a triumph of the spirit. This film of that event has as its premise that to endure is to live and finally to triumph. It engages with the shamanist ritual of healing. These six extraordinary performances filmed in a series of epic takes is an art film unlike any other you’ll witness. The film unfolds over four hours, following the durational nature of the original performances. Paddy Cahill and Amanda Coogan’s film presents concurrently on a single canvas the six live performances. 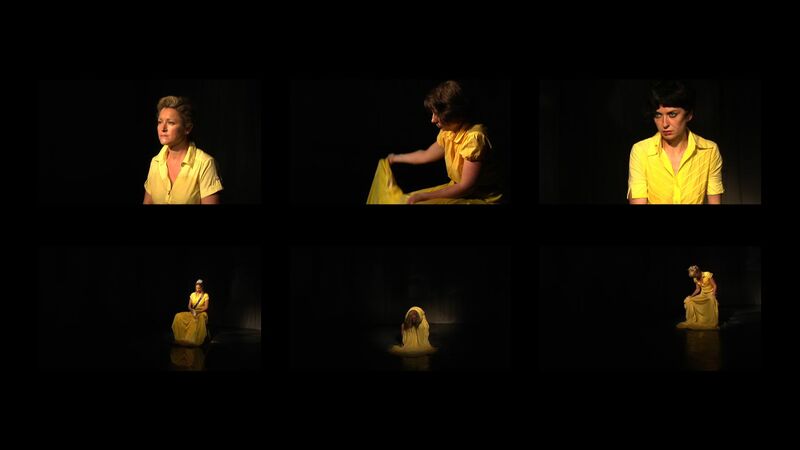 Yellow is a film of live durational performances. Visually stunning this work negotiates the most avant-garde of practices, durational performance and allows us to witness the journey through endurance of each of the six performers. Durational performance art and film heretofore have had an unsatisfied relationship. Cahill and Coogan came together as filmmaker and performance artist to explore how to expand the relationship between film and live durational performance art. No longer satisfied with turning durational performances into short videos. They have peeled back the editing process to reveal the durational nature of the original artwork. Creatively using new digital capture techniques they captured each four-hour performance as one live unbroken take. This methodology was continued over the six nights of the live exhibition and the individual performances. Cahill, equipped with a stabilized camera rig, was free to move around and performatively engage with the live art works. This resulted in six individual documentations of live performances which they then turned into a new film by placing them side by side and running simultaneously on the one canvas. Allowing us to witness the unedited performances as one visual piece. The filmmakers motivated the narrative through the sound edit guiding the viewer to different parts of the unfolding performances.